If extremism fails, how about moderate political party? One answer: why bother? You can achieve moderate goals by simply electing a mix of Democrats and Republicans. Another answer: moderate parties fail as well, partly for the reason in the previous paragraph. However, moderate parties do often come much closer to succeeding. Indeed, candidates have been elected to offices as high as governor under the banner of various moderate parties. And moderate parties have done much better at the presidential level than the ideological parties – at least during the last half-century. Despite these successes, moderate parties have a tough time; centrist parties generally collapse faster than the radical ideological parties who experience less success. The Reform Party is a tiny ghost of its former self. Even with millions of federal dollars and plenty of name recognition, Pat Buchanan barely squeaked past the Libertarian candidate who was an under funded unknown. A moderate would be one who takes a mix of Democratic and Republican positions, right? Well, which mix? We have two moderates. 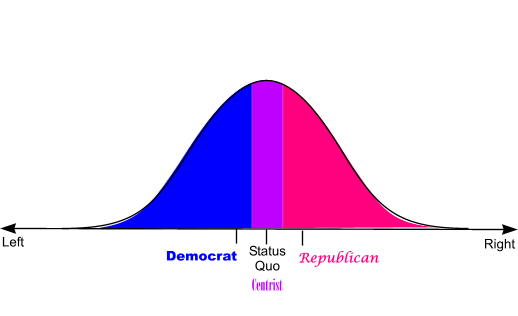 Each takes an equal number of Democratic and Republican positions. Yet these moderates have nothing in common! There is just as much difference between these two moderates as between the Democrats and Republicans! A third party need not be a “Party of Principle,” as the LP strives to be. An overly strict ideology results in a party too small to win. But a party does need to have enough organizing principles do determine who is invited to join. 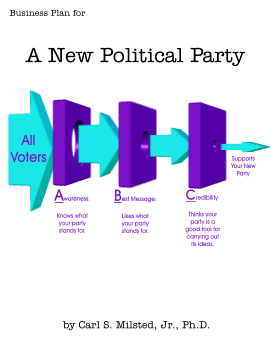 Party members can disagree on many things, but there must be more agreement within the party than between the parties. In practice, moderate parties tend to coalesce around celebrity candidates and collapse soon thereafter. The celebrity candidate’s mix of positions provides the temporary cohesion to keep the moderate party alive long enough to win an election or few. This works, but not that often. To see why, look at the figure below. Here, we have a moderate candidate running against a Democrat on the left and a Republican on the right. If the Democratic and Republican candidates are sufficiently radical, then the moderate candidate has a shot at winning. If the major party candidates move toward the center, the moderate party candidate gets squeezed from both sides. This is a likely scenario! The Democrat has a base locked up on the left. She loses no votes by moving to the center while gaining votes from the moderate. Similarly, the Republican gains centrists by moving to the center while holding on to his conservative base. True, if the major party candidates move too close to the center, they lose the passion of their respective activist bases. But this is less of a concern in a three way race with a moderate! A candidate need not win a majority in this scenario. A bit over 1/3 is all it takes. The Democrat and Republican can locate closer to their respective bases than if they were in a two way contest! A moderate candidate in the center can help elect a more radical candidate from either the left or right! As bad as conditions are for a centrist in a three-way race, they are even worse for an extremist – at least as long as we are looking at politics in one dimension. Once we look at politics in two or more dimensions, the prospects for a third party candidate look much better. But before we look at politics in 2D, we need to deal with the dreaded Lesser of Two Evils Dilemma. Up to now I have underestimated the challenges faced by a radical new political party. It is time for a dose of harsh reality.